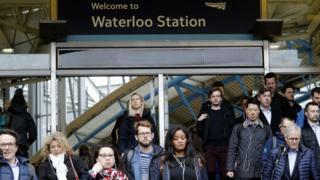 Rail passengers face disruption for most of the day after engineering works overran at London's Waterloo station. Services to and from what is the UK's busiest station, will be delayed until at least 18:00 GMT, South Western Railway said. Trains were unable to enter Waterloo until about 07:00 GMT, causing knock-on delays or cancellations. All stations on the line have now reopened, National Rail said, but passengers have expressed their anger. It added disruption was set to last at least until the afternoon and urged passengers to consider other transport options. South Western Railway apologised to travellers. "Services are being delayed due to over-running engineering work, sorry for the inconvenience this causes you this morning," a spokesperson said. People have taken to social media to complain of their dismay.